A long while ago, there was this band called Chickenhawk that made ace music. Then it changed name, designated themselves Hawk Eyes and continued to do ace music. Then they released an EP called Mindhammers. Twas good. 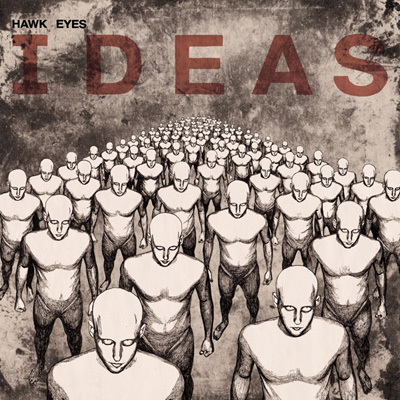 Less than 6 months later, they deploy a tactical nuclear riffage called Ideas , which still gets regularly played here at the office (i.e. a basement in México with a branch in Sheffield). 1. First of all, thanks for pushing our eardrums with such riff-filled music. Who’s your fave shredder/guitarist? I don’t have one favourite guitarist, perhaps some sort of human hybrid consisting of: Robert Fripp, John Petrucci, Billy Corgan, Buckethead, Omar Rodríguez López. 2. Good luck with the Kerrang nomination for new band – Where you expecting this sort of reaction to Ideas? No, we are incredibly grateful to Kerrang for the support, they must have 100s of bands each day vying for their attention. 3. You released the Mind Hammers EP less than 6 months ago and now you have a full, fantastic rock album out. Not a complaint, but what’s the rush? Striking while the iron’s hot? No rush at all, it’s simply that we like making music. We try and make everything the best it can be. There are always plenty of riffs and ideas flying around. 4.Gotta ask this one: The name change. Why? We’ve been in this band a while and it got to the point where people had heard of the band, we didn’t really like the name in the first place so we chose one we did. 5. Who designed the cover artwork? Quite cool, feels very old school sci fi cover. Tommy Davidson, very talented artist from Leeds, he also drums in These Monsters. All the figures on the artwork are individually handdrawn, we were/are so pleased with how it turned out. 6. There’s quite a heavy rock scene in Leeds right now. What do you think is fuelling so many bands going to the heavier side of the spectrum while the trendy rags seem to favour the melodic indie stuff? Ever since I moved here Leeds has had an amazing heavier scene, nothing has really changed its just that some of the bands are getting known better. Humanfly, False Flags, EDT, Tangaroa, Red Stars Parade, Eiger, Polaris, Agent of the Morai, the list goes on and on and all of serious quality. 7. I see you are busy to no end! What big plans are afoot for the summer? Aside from playing Download, Hard Rock Calling, Hevy Fest, loads of European festivals and more UK ones? Hopefully some sleep! As you said we are very busy and glad to be! 8. You’ve opened to Andrew W.K., I’m a big fan of him, how did that one went? Very good, his band and crew were very kind to us and the gigs were brilliant, more please! 9. You’ve used Pledge Music, what are your thoughts about crowdfunding? Is it the way forward for new bands like you? More bands seem to be using Pledge, Ginger Wildheart introduced us to it and we had an incredible response to it. I don’t think its the only way forward but it is definitely a big positive for all types of bands. Hawk Eyes Website. Facebook. Myspace. Twitter. Posted in Interview, InterviewsTagged Hawk Eyes, Interview, LeedsBookmark the permalink.